Sayles ordered an engraved copper plate from a local engraver named George W. Babcock. The plate was originally intended to comprise sixteen subjects, arranged four by four, including twelve 5¢ and four 10¢ denominations. 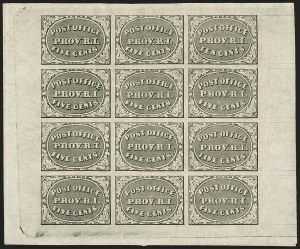 The total face value of a sheet printed from the plate in this original format would have been one dollar. After the layout lines were etched into the copper surface, the decision was made to reduce the number of subjects to twelve, comprising eleven 5¢ denominations and one 10¢ subject at the top right of the printed sheet. The finished plate and order for printing was given to Henry A. Hidden & Company, a large commercial printer of bank notes. The assistant postmaster, Robert H. Barton, applied gum to the backs of the sheets from two bundles (200 sheets). Two more bundles were subsequently gummed in a similar manner. Thus, 400 of the 500 sheets were gummed at the post office, and the remaining 100 sheets were left ungummed. The ungummed remainder sheets were found and gummed years later, but that gum is thick, brown and lumpy. The original gum, as seen on the sheet offered here, is evenly applied and light in color.